I was reading through a variety of things on my desk this weekend (trying yet again to get organized) and thought I would share a few of the things I found. I don't know about you, but as holistic as the rest of my life is, when one of the kids get hurt or sick many times I'm tempted to reach back for the over the counter things I've used for years instead of trying holistic remedies that would be better for us. I thought it might be good to share some ideas of common home remedies and then start stocking our medicine cabinets with good things to prepare for those times when we need them. Did you know that grapes are one of the most effective home remedies for treatment of a cough? Grapes tone up the lungs and act as an expectorant. How easy is that. A cup of raw (not pasteurized) grape juice mixed with a teaspoon of honey is a great natural cough syrup. For burns (I have many kitchen accidents), run the affected area under cold water or ice for 15-30 minutes. then apply honey to the area. The honey will prevent infection and start the wound healing. As I've started to eat more raw fruits and veggies, and started juicing, my body has been detoxing, and it started to show up on my skin as acne. It's always nice to go back to those teenage years! Something I've found affective is to use lemon juice as an astringent and for healing. And how about this one...Carrot soup is an effective home remedy for diarrhea. Who knew? It supplies water to combat dehydration; replenishes sodium, potassium, phosphorus, calcium, sulphur, and magnesium; supplies pectin; and coats the intestine to allay inflammation. It also checks the growth of harmful intestinal bacteria and prevents vomiting. Wow! So, on your next shopping trip you should include grapes, honey, lemons, and carrots and you will have the beginnings of a few fantastic remedies for those occasional times when we are not at our best! Amazing! We will revisit this topic often, but in the meantime, what are your favorite home remedies?? Please share! P.S. Make sure to check back tomorrow morning...Shannan and I have a great surprise for you! 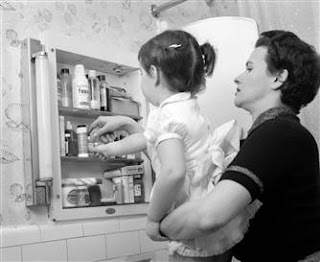 Labels: Children's Remedies, Home Remedies, What's in Your Medicine Cabinet? ?